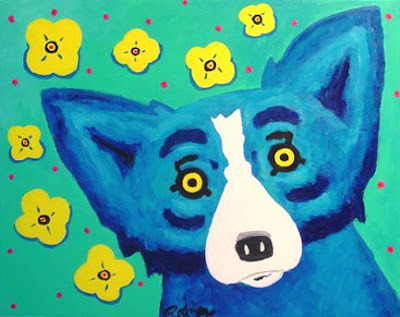 As I’ve mentioned before, it was many months before George Rodrigue returned to his easel following Hurricane Katrina, and when he did, the paintings were dark and fragmented, far different from the bright colors and strong designs normally associated with the Blue Dog Series. 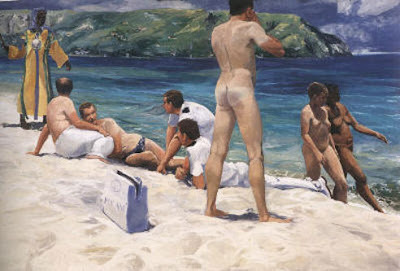 Not only was he without a studio space to work, but also he felt little motivation to paint in his normal fashion. 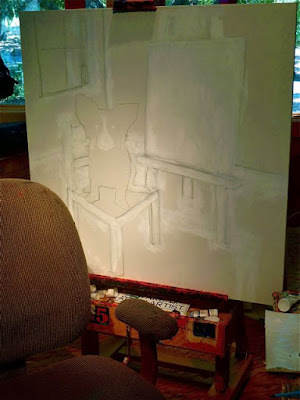 George has always said that his favorite painting is the one he’s working on now, and that in order for him to be happy, the work must be exciting for him. There was no happiness to be found in the months following Katrina. That does not mean that he stopped creating. 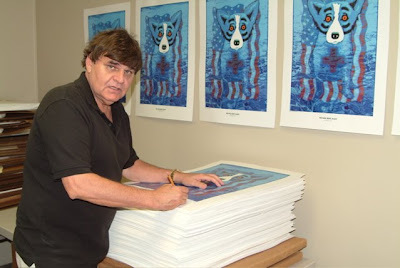 To the contrary, he devoted his efforts to a series of original silkscreen prints designed to raise money for Gulf Coast humanitarian, education, and arts needs following Katrina, and on-going for the next two years. 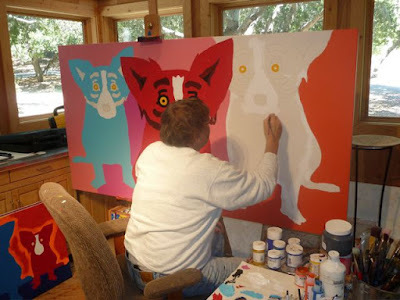 He called the prints following Hurricane Katrina “Blue Dog Relief,” and used the money from their sales to help support not only humanitarian organizations such as the Red Cross and United Way, but also Louisiana’s struggling arts programs, many of which were unable to operate and generate funds for months. 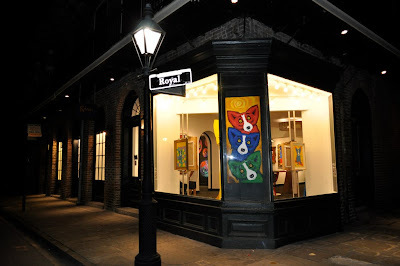 This included the Louisiana Philharmonic Orchestra, the New Orleans Museum of Art, the New Orleans Book Fair, the Louisiana Endowment for the Humanities, the Artists on the Fence (surrounding Saint Louis Cathedral), and many more. In one instance, Blue Dog Relief funded a Washington D.C. trip for an entire school class from the Lower Ninth Ward, so that they had the opportunity to see our government first-hand and share the needs directly of their neighborhoods and schools. 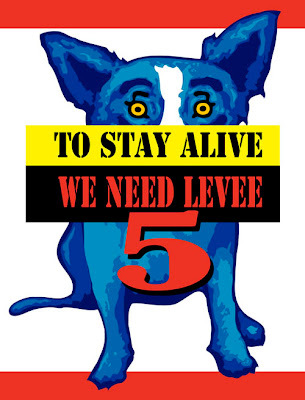 In response to our government’s failure to protect our city, George created To Stay Alive We Need Levee 5, a succinct phrase describing the importance of levee protection able to withstand a category five storm. 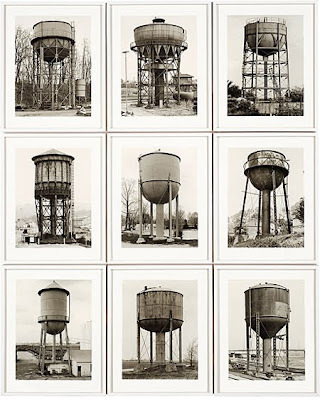 Not only did he sell this fine art silkscreen to benefit local programs, but also he delivered one print, along with related buttons, bumper stickers, and even t-shirts (something he’s otherwise avoided), to each member of Congress, with hopes that seeing the message in these formats and hanging on their walls might drive home the importance of levee protection. 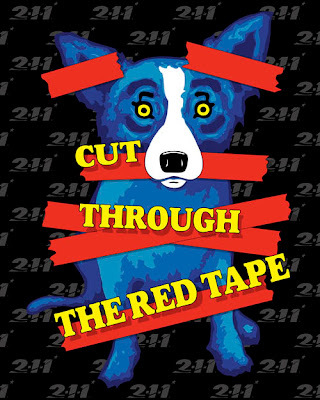 He created Cut Through the Red Tape for use by the United Way for national promotion of its 2-1-1 dialing system, eliminating the red tape involved in reaching human service agencies following disasters such as Hurricane Katrina. 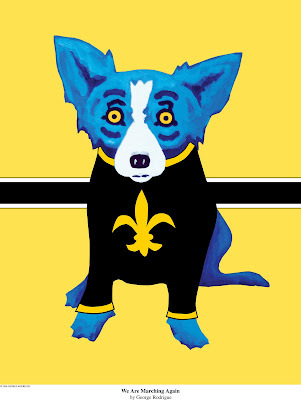 He adopted the design for You Can’t Drown the Blues from an old jazz photo, reinforcing the importance of our culture, the very heart of New Orleans, and the reason why our city is not only worth saving, but also worth protecting. 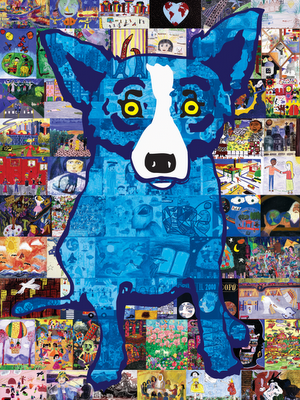 And finally, the most successful of all of the prints from Blue Dog Relief was We Are Marching Again, the strongest sign of optimism from George in this series, timed well with the parallel hope and pride reverberating through a city desperate to look forward and pull itself out of its depression. 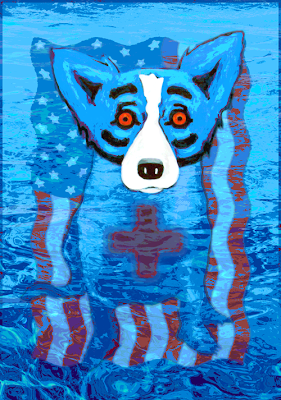 In retrospect, Blue Dog Relief began not with We Will Rise Again and Hurricane Katrina, but with God Bless America, George’s response to September 11th, 2001. (pictured here, and detailed in its own post). 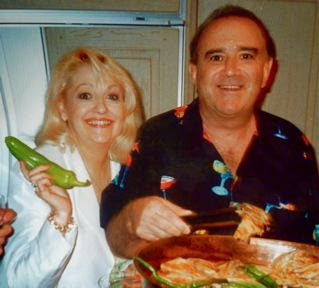 But it was after Hurricane Katrina in 2005 that the series became a daily part of George’s efforts and our lives. 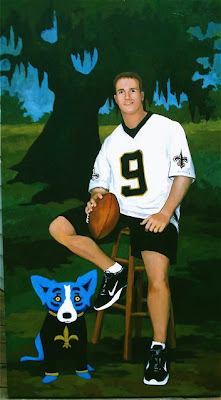 Following We Are Marching Again, Blue Dog Relief continued when he collaborated in 2007 with Drew Brees (pictured below) to raise funds for the Brees Dream Foundation through sales of prints of the Quarterback's portrait. 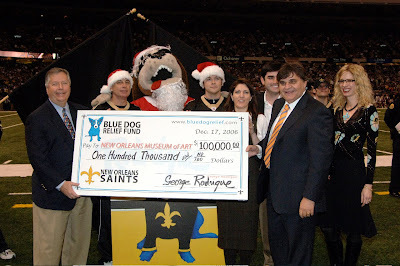 This partnership grew out of our relationship with the New Orleans Saints football team, especially Rita Benson LeBlanc, who championed George’s efforts with Blue Dog Relief with extensive and enthusiastic promotion of the print We Are Marching Again during the 2006 football season. 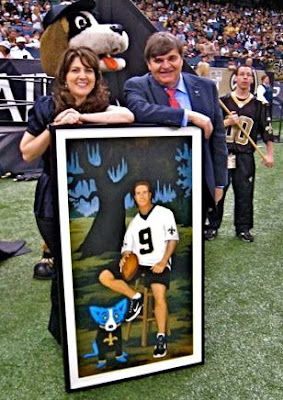 There is no doubt that we owe the tremendous success of this print to the Benson family and, of course, to the generosity of the Saints fans. So how much money are we talking about? 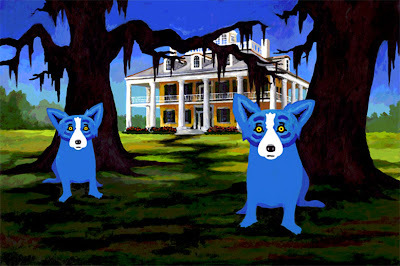 All together Blue Dog Relief raised nearly $3.5 million for humanitarian organizations such as the Red Cross and United Way, arts organizations such as the New Orleans Museum of Art and the Louisiana Philharmonic Orchestra, and educational programs, such as the International Child Art Foundation and the Louisiana Endowment for the Humanities. In addition, we gave money away to nearly every needy cause that came calling, whether a musician who lost their instrument, an artist who couldn’t pay their rent, or a family in need of food and shelter. Frankly, as long as we had it in the fund, it went to good use. Furthermore, through Blue Dog Relief we not only supported our staff, which was hard at work processing, packaging, and shipping these orders, but also we encouraged and noticed a change in them, as the program filled their own needs to help New Orleans, even as they struggled with their personal losses. In a way this mindset transferred to the thousands of people who bought these prints as well, along with the New Orleans Saints and the many publications, websites, and other media that promoted the program. 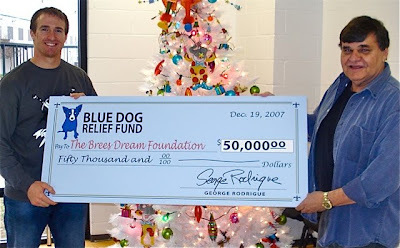 Through Blue Dog Relief, many people found an outlet for their generosity and their need to help. 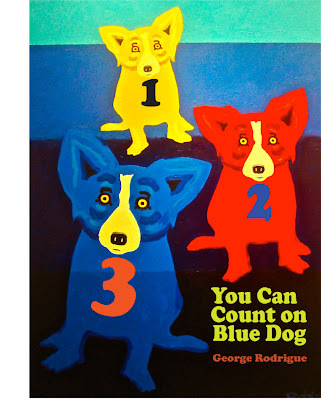 Eventually George (along with the rest of us) felt it was time to move on, and Blue Dog Relief faded from our day-to-day efforts. 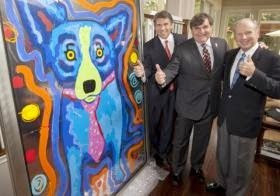 Its impact, however, remains, and in its place George founded the George Rodrigue Foundation of the Arts (GRFA), promoting the arts in all areas of education through scholarship programs, art supplies, and various opportunities such as lesson plans, exhibitions, and school visits. 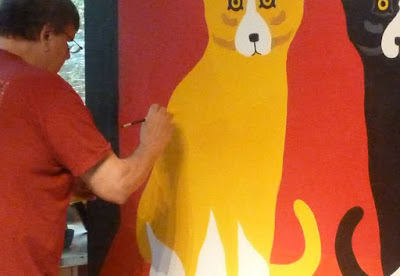 Through GRFA, George focuses on something close to his heart and constantly in need of attention: education in the arts. 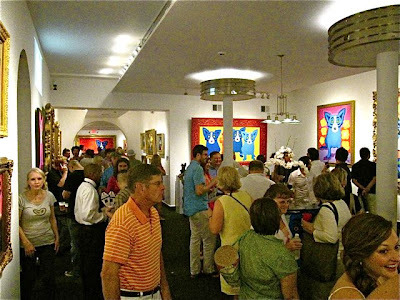 In the past eighteen months we’ve been approved for non-profit status, hired a full-time GRFA staff, launched a scholarship arts contest, honored our first award recipients, held student exhibitions, developed lesson plans, and hosted thousands of students with programs both in George’s gallery and in individual schools. We've also joined with hospitals and donors to install artwork, teach art therapy, and visit with patients at children's hospitals in Texas, Tennessee, and Louisiana. 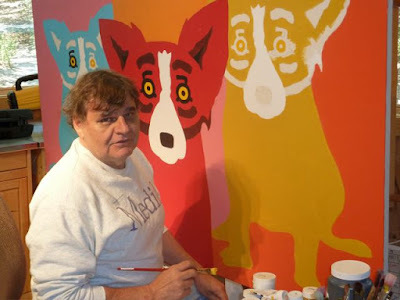 GRFA is a full-time commitment and, best of all, a way for George Rodrigue to contribute to a meaningful and personal cause, with an on-going and positive result. 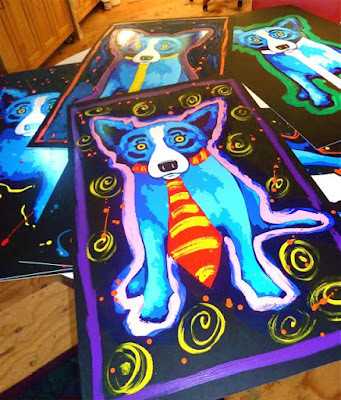 The disasters that inspired Blue Dog Relief, unfortunately, seem to keep coming. 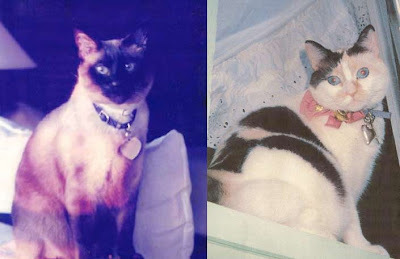 However, thanks to GRFA and its programs, we’re no longer waiting around for the next one. 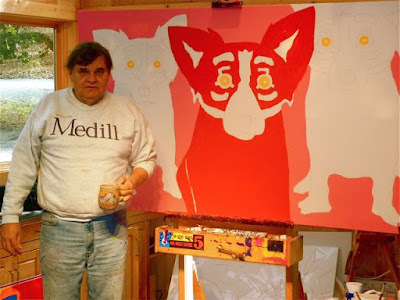 For information on donating to the George Rodrigue Foundation of the Arts, see the headline “Do You Enjoy Musings?” to the right of this post. 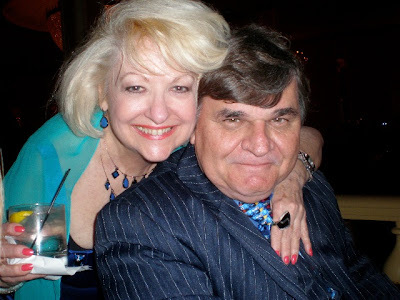 For our personal story following Hurricane Katrina, visit here. 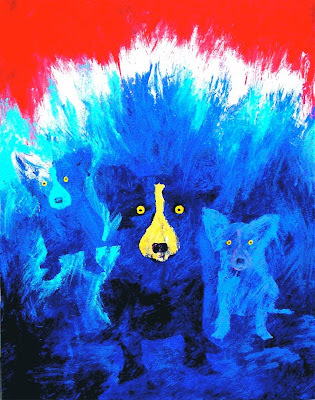 If you follow this blog, you have a good understanding of the Blue Dog’s history (and if you don’t, check out the links under ‘Popular Musings’ to the right of this post). 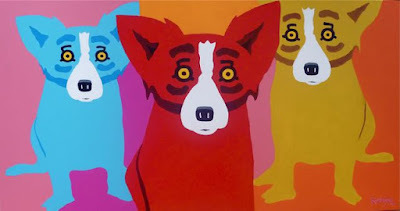 From the loup-garou to Tiffany to Blue Dog Man and the Abstract, the image has developed in style and meaning along with George Rodrigue and his interests. 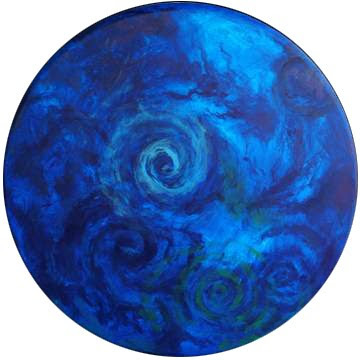 If something affects him in life, it probably shows up on his canvas, sometimes, as with the Dark Period following Hurricane Katrina, in more obvious ways than others. 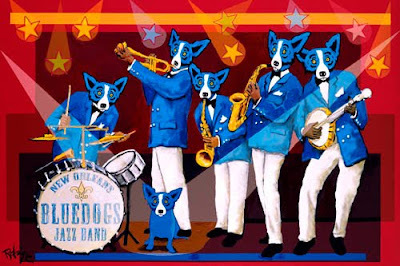 Throughout, however, the Blue Dog retains an underlying quality more consistent than its Cajun roots, its repetitive and hard-edge “Pop” style, and its predictable stance. 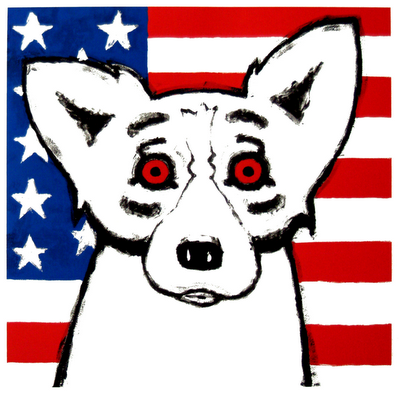 The Blue Dog, after twenty-five years of development remains, always, American. 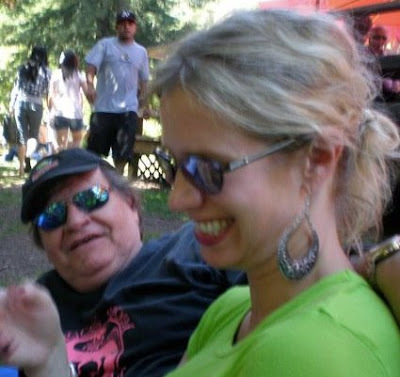 This was possibly subconscious on George’s part. 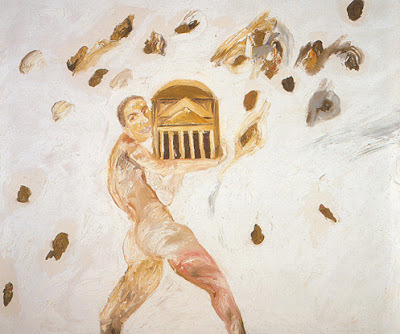 His Cajun paintings already focused on patriotism, as detailed in last week’s post. 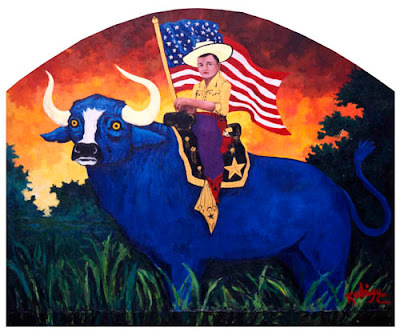 The American flag appears in a large portion of those works, a trend that continues into the Blue Dog Series, such as Tee George on the Bull from 1996, a life-size (six foot) canvas adapted from George’s childhood photo of 1949. 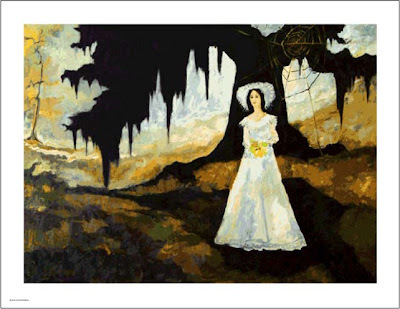 (This painting always reminds me of an early review of George’s paintings from the French newspaper Le Figaro, in which they describe him as the “Louisiana Rousseau,” an ironic recollection given the nature of this post). 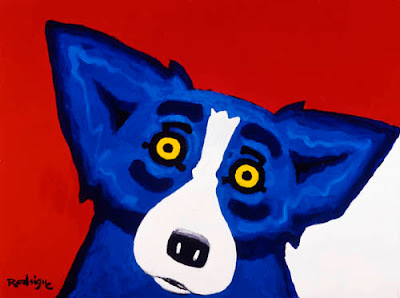 The early Blue Dog paintings from 1984 and into the early 1990s were not the strong bold blue of today’s image. Rather, as detailed in the post “Blue Dog In the Beginning,” the dog is a pale grey-blue, as affected by the night sky. 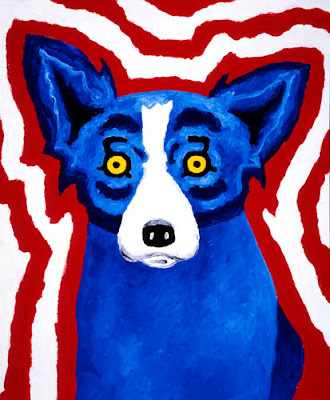 As George tightened the image and strengthened the design, however, he also saturated the dog with color, as though the blue could not be intense enough. The same can be said of the typical American blues and reds on the Fourth of July, so much stronger today than those on our early American flags. 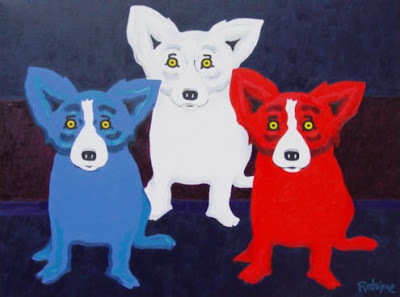 George’s use of our patriotic red, white, and blue is a natural meld with the Blue Dog. 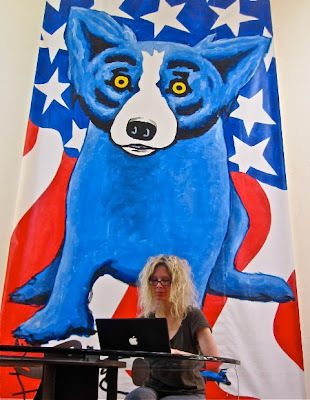 There are dozens, maybe more than one hundred, Blue Dog American themed works highlighting these symbolic colors, including the hand-painted banner hanging on the wall behind me as I type this post, a piece that originally hung for three weeks (along with four other American Blue Dogs of this size) on the outside of Union Station in Washington D.C. But it’s not just the colors that inspire George. 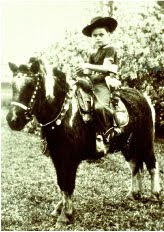 It’s the American spirit, as alive in him as it is in most Americans. It’s that love of our country that sends us on our cross-country drives each year, exploring the land, studying the history, and meeting the people. 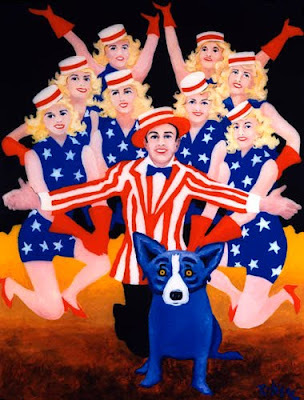 In addition, the American musical, specifically the Yankee Doodle-type, sing-your-heart-out, tap-dancing enthusiasm of post World War II Hollywood, stirs George’s patriotism, as in his portrait of Gene Kelly below (1993, 40x30). 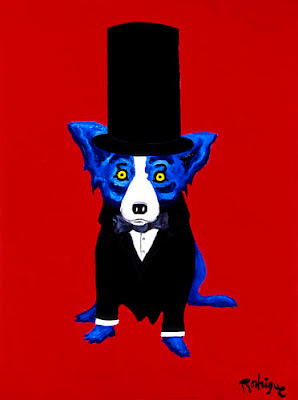 Perhaps George’s most significant American-Blue Dog images are those following September 11th, 2001. I share with you the painting Wave Our Flag, 40x40, below; however, his most profound work is, unquestionably, God Bless America, a painting I’ll describe in detail next month, including the story of its print and a shared and panicked desire to help one’s fellow Americans. 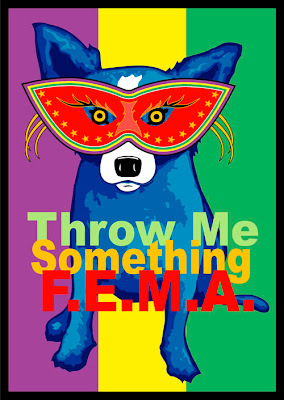 Similarly, We Will Rise Again following Hurricane Katrina taps these emotions and is better spotlighted in its own post. 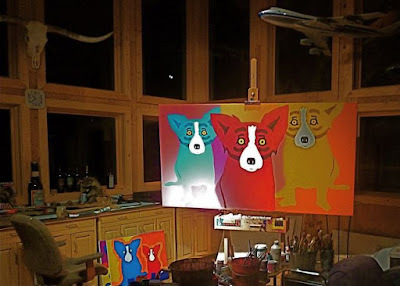 Other than works for Blue Dog Relief, it was many months before George returned to his easel after ‘the storm,’ and when he did, as described here, the paintings are fragmented and rooted in confusion, no different than George himself and certainly every person affected by those times. He held onto his patriotism, however, while struggling with his depression and disappointment, with hopes that tomorrow’s America would beam brighter, ever deserving of its red, white, and blue. 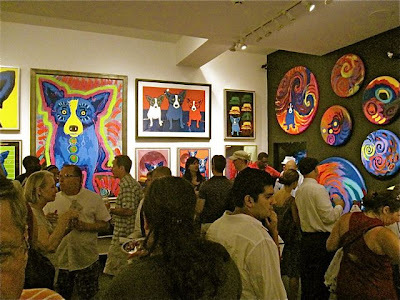 The images in this post are of original, one-of-a-kind paintings. 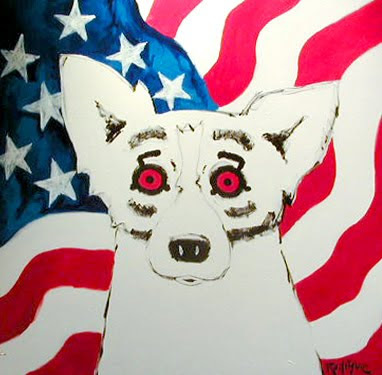 However, Rodrigue created many silkscreen editions over the years celebrating America. 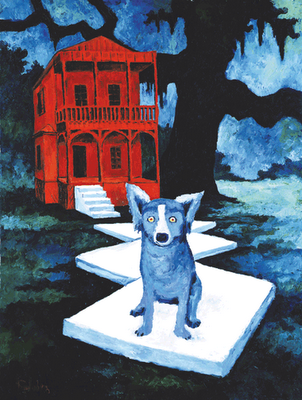 For images visit here, and for the complete collection, see the book George Rodrigue: Prints (2008, Harry N. Abrams, New York).